The Chinese or Lunar New Year isn’t complete without these laughing balls and I can understand why. But it is also a great snack for your kid’s birthday party. Don’t you think? Unforeseen, unpredictable situations are not a new thing for us, Army Wives. Other than the so-called inevitable thing you would relate to any Armed Forces Officer’s life, there is one thing that always bothered me – Hindi is the Army Language. I hail from South India, but I knew to read and write Hindi. I also understood the language fairly well, thanks to a childhood being addicted to the Bollywood movies and songs. However, there was one thing I could do -to make a conversation in Hindi. Well, I never tried because come on’ the soldier husband has been away from Kerala for the last eighteen years and he is so fluent in the language. He doesn’t mock me or anything, but I was kinda shy and embarrassed for no reason. Anyway, I knew I should try and pick it up and thus started conversing with my maid. One day I wanted to tell her that we are short of Turmeric powder and I simply couldn’t recall the word ‘Haldi’ which is turmeric in Hindi. I tried to make her understand by pointing to things that were yellow in color. Imagine my broken Hindi and randomly pulling out clothes and curtains with an undying hope that the maid would catch on to what I was trying to say. The best part was the husband was watching all this trying to mask his giggles. I will give you one more scenario. Once an officer informed his wife of having few friends over for lunch. The new bride was worried and thought to seek help from the Sahayak Bhaiyya. She wanted to ask him to buy a chicken for preparing the curry. But poor she! She didn’t know how to say chicken in Hindi. She tried different ways to convince him(just like me!). However, sign language didn’t seem to work. Finally, a lightbulb flashed above her head like in the cartoons. She showed him an egg and said, “Iski Mummy ko leke aao”(Bring the egg’s mommy!). Nope, not my story! Every cookie that is served during Chinese New Year has a meaning which is often happiness, prosperity, health, or good luck. These Laughing Balls or Smiling Sesame Cookie Balls are no different. This natural cracking on the balls makes them look like laughing mouths and serving them means your year will be filled with smiles, happiness, and laughter. 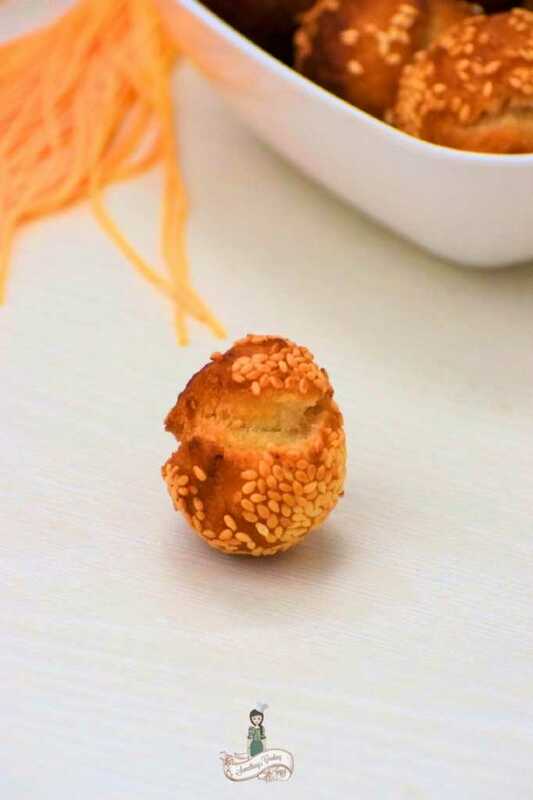 Laughing balls are deep fried cookies rolled in sesame seeds. They are golden in color and are crunchy on the outside and pillowy soft on the inside. They are ridiculously addictive, super easy to make and can be even stored in airtight containers for up to a week. Honestly, I burst into a laughter when I saw these natural cracks happening right in front of me while deep frying the sesame balls. You must definitely try this one. 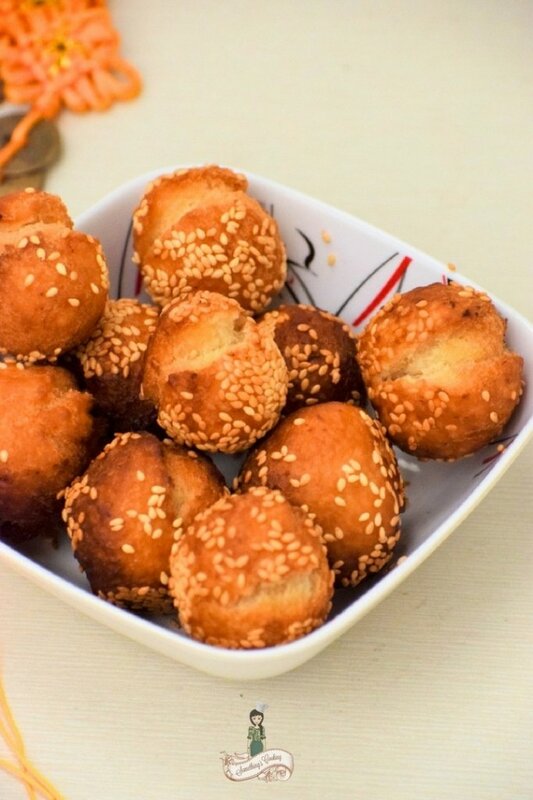 Laughing balls are deep fried cookies rolled in sesame seeds. They are golden in color and are crunchy on the outside and pillowy soft on the inside. They are ridiculously addictive, super easy to make and can be even stored in airtight containers for up to a week. Sift together the cake flour, salt, and baking powder. Set aside. Dissolve sugar and hot water. Set aside. Whisk the egg. Set aside. Add the sugar mixture and whisked egg to the cake mixture. Knead well adding 2-3 tbsp of oil to a soft dough. It shouldn't be sticky. Set aside for about 30 minutes. Spread sesame seeds on a plate and keep a cup of water aside. 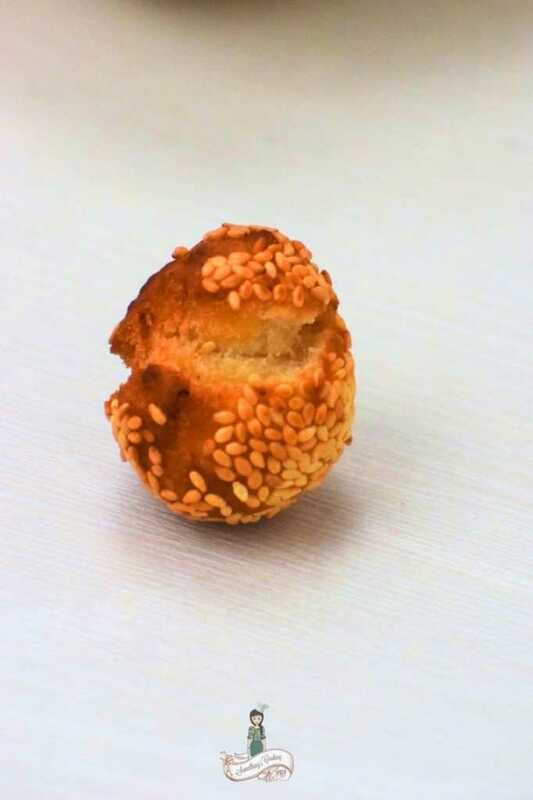 Dip your fingers in water and lightly moisten the balls before rolling on the sesame seeds. This will ensure the seeds stick onto the balls. Heat oil in a small pot. Slide 5-6 sesame balls into the oil and deep fry. Cook fr about 3-4 minutes till it floats up and cracks open naturally. The sides will be evenly browned now. Remove and set aside on paper towels. Once cooled, they will be crispy. Best when fresh but you can store up to a week. This is one recipe I’d never heard of. I must say I was intrigued by the title – laughing golden balls. I will definitely try it out for the grandsons when they come next for tea. Interesting story of not knowing the language and surviving. I am trying to get hold of Kannada but still its more of a sign language for me. 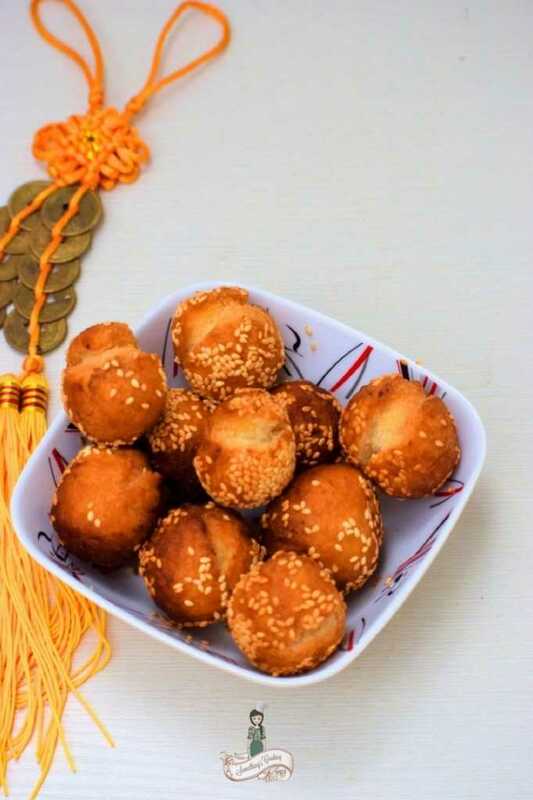 The Chinese balls look yummy and easy to make too. 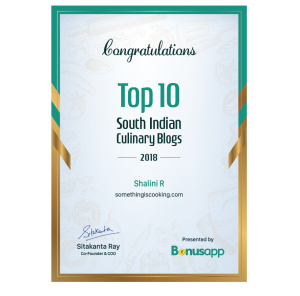 What cute anecdotes you share Shalini; there are a couple of army wives-bloggers who have pubished their stories about love in Khaki – but they come nowhere close to the warmth and humour of yours. You must definitely try your hand at writing about life with a soldier – you will do full justice to it! BTW what is cake flour? you mean maida? Could I subsitute it with atta or jau k atta? I first read Muffy’s post and cried and cried. Then I came to this food post and had a super time laughing uproariously over your turmeric story and your friend’s chicken story…”Iski mummy ko leke aao!” hehehehe. ..Oops, sorry, but this was hilarious, Shalini! Now, about your post.. We make something similar using wheat flour and sugar, and we call it ‘Gulguley’! Sweet bhajiyas. But, I would like to try this recipe sometime as it is sounds quite interesting! WIth the sesame seeds on the outside that make it crispy! 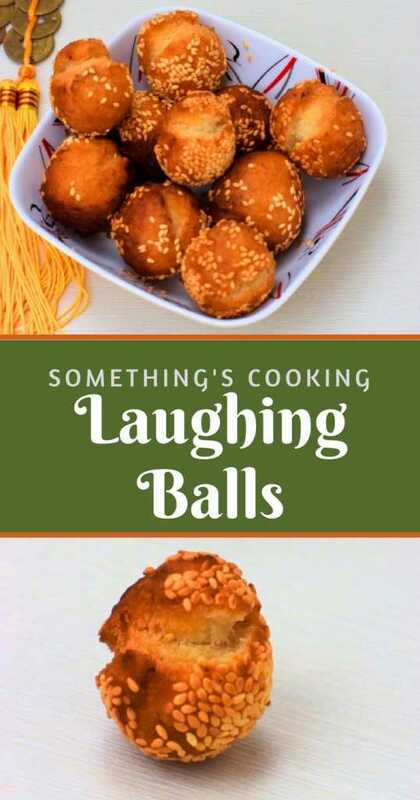 Love the name of this recipe and they do look like laughing balls. I’ll try this recipe soon, so simple and it looks so delicious!